Villa Despina provides breakfast as extra allowing guests to choose from a variety of breakfast options and having it delivered fresh and hot in a basket at the villa in the morning hours. There are three varieties (Classic breakfast, American breakfast, and Cretan breakfast); a breakfast can be prepared for two person minimum, up to 6 persons maximum). The price per person is 10 Euros, but please allow for a small discrepancy due to the different varieties. Are you familiar with terms like: ‘rare opportunity’ and ‘for the select few’? Not as a selling gimmick but more as a real chance to experience something positively different than most other travelers will. If so you should be able to recognize one when you see it. Have you ever stayed at a traditional Crete mansion? We are not talking for those properties for the tourist hordes, but a real villa house, made of stone and old wood - not bricks and cement. Normally you shouldn’t have. Crete people rarely open their country houses to others, they keep them to themselves and their loved ones; they have different properties that can be rented by travelers. But you may have visited such a house by accident, if any local person ever invited you to a meal or a wedding celebration. Photos will only give you a small part of the whole experience in staying at this villa house, because most of the experience can’t be framed in a snapshot. How can any photo tell you that you will be staying in a region whose origin can be traced back 2,500 years? Or that it enjoys one of the finest climates on the island? Even give you a hint on how the air smells in the morning and early evening. 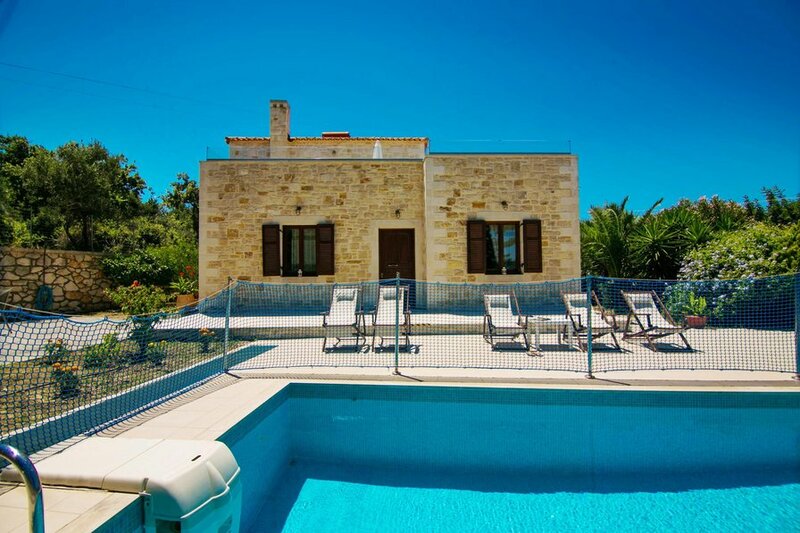 Or pass you the feeling of peace and tranquility in a beautiful village surrounded by hills and olive groves? Or the smell of the house's interior? And then it’s the ease of access to it that makes it a great candidate for accommodation. An ideal location for those wishing to explore the island because as we say: ‘it is close to everywhere’. Just 20 minutes drive from Rethymnon town (about 5 miles) the Port and the Center. But also close to Heraklion (60 min. ), Chania (50 min.) and Sitia (2 hours) with numerous beaches no more than 20 min. away by car. The village of Prines is beautifully organized with everything you may need for your stay; you will find grocery stores, taverns and everything else just 500 meters away from your quiet neighborhood. The house is ideal for you whether you are a group of people, a large family or a smaller family, even a couple. And we arrange it to be an exact fit to your stay, no matter if this means extra “chez long” resting chairs around the pool, or a baby cot, or whatever is necessary. This 130 sq. m. mansion is divided in two floors; the ground floor has two bedrooms (one double and one with two single beds) and a bathroom with bath tub. There is also a living room (the two sofas can be converted to sofa beds) and a fully equipped kitchen. On the first floor there is another double bedroom with en suite bathroom (with shower) giving access to a big veranda with views towards the sea and the surrounding mountains and hills. At the ground level there is a 40 sq. m. swimming pool with sun beds; there is a barbeque at the garden area. The mansion has air conditioning and heating. It also comes fully equipped with Wi-Fi and satellite TV. There is a stove, a microwave oven, a washing machine, a dish washer all necessary kitchen utensils and of course hot running water. There is also parking available for the duration of your stay. Cleaning and linen change is taking place once a week, or between stays for shorter renting periods. Should you have a baby with you, we can arrange for a baby cot and a high chair, just let us know. So what are you waiting for? Make the move. Go a bit different this time; take advantage of this rare opportunity and be one of the select few who will truly enjoy their stay in Crete, at our beautiful traditional mansion during the coming season.